>Ladders are large, heavy and cumbersome to move. Even once you get them where you need them to be, they’re hard to balance on without someone to stabilize them for you at the bottom. Everyone has put off chores around the house because they didn’t want to use their old rickety ladder to get the chores done. Luckily there is a solution. We have assembled a list of the best step ladders that will help you get your honey do list done without all the fuss and bother of traditional ladders. The Flip-N-Lite 6 Foot Stepladder is our #1 Gold Pick winner. It’s made by Little Giant Ladder Systems, a company known for its high quality products and its customer satisfaction. The Flip-N-Go has a body that is made of rust proof, aerospace-grade aluminum with polymer made anti-skid protection, handrail covering and standing platform. The thick, scratch proof anti-skid feet are attached by rivets and are ribbed for a sure, stabilizing grip on smooth surfaces. They are 2/3” thick on the main legs and are 1/2” thick on the supporting legs, so they won’t wear down or wear off. The ladder’s shape tapers from a slightly narrow 13.25” at the top to a broader 21” wide base, further adding to its structural stability. Accounting for the height of the tread, the distance between the three steps is 12”, with the platform above the 3 steps measuring in at 45”, or 3.75’ from the floor. The overall footprint of the Flip-N-Lite stepladder when open is 39 1/2″ from front to back and 21 1/4″ from side to side. It is touted as a stable ladder and it lives up to its reputation. When closed, it has a narrow profile of only 5 1/2” thick. The Flip-N-Lite stepladder has an impressive 300 lbs. weight bearing limit and is classified as a type IA professional ladder. Its aluminum frame has a smooth finish without sharp edges or burs and because of its aluminum construction, it is lightweight, despite its size. The wide, covered top bar on the ladder has a handy 3″ W by 12″ L by 1″ D tray for holding small objects for you as you work. The sides of the ladder go out a full 25” above the platform, so you can lean on the bar a steady yourself while using both hands to work. The Flip-N-Lite stepladder comes fully assembled with instructions included and is backed by a 1 year warranty. Unlike many ladders, the Flip-N-Lite is made for safety. It’s a sleek, lightweight aluminum ladder that is made to be stable. It is the perfect ladder for anyone who doesn’t like the unsteady feeling of being up high on a rickety ladder. It super grip, anti-skid feet and broad base with gently tapering top give it superior solidity. The top bar is also purposely made to further its stability by being designed to let the user lean in on it to help them balance. The standing platform allows the user to place their whole feet on it as they work instead of balancing on either their heels or the balls of their feet on a narrow ladder step. 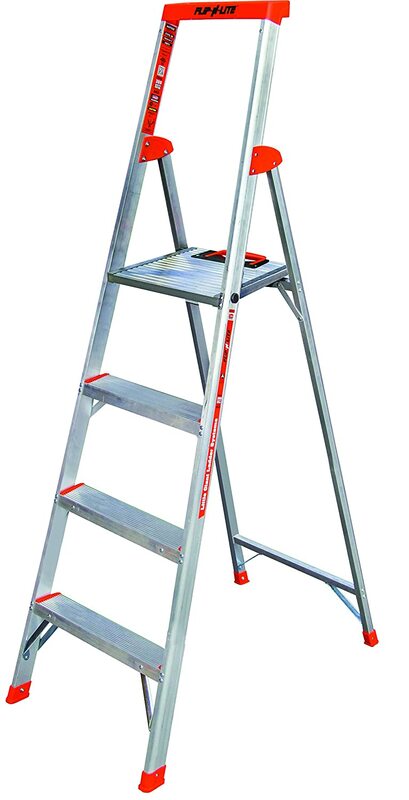 Safety and convenience are the driving thoughts behind this high quality stepladder. The Flip-N-Lite is a breeze to open and close. It is also made to open and close with only one hand. Unlike heavier fiberglass or wooden ladders, its lightweight aluminum body makes moving it easy for just about anyone. Despite this, it has a professional type IA classification and is strong enough to hold up 300 lbs. easily, meaning larger people can use it with confidence. The manufacturer, Little Giant Ladder Systems, is a company known for its high standards of quality so this stepladder is made to last. There are a few drawbacks though. The ladder lacks a locking hinge, which while it allows for a fast set up, also means that the fast take down can pinch you fingers if you are not careful. Storage may also be an issue. Also, given its height, it won’t fit into most coat closets. The Flip-N-Light stepladder is simply the best stepladder when it comes to safety and ease of use. It is ideal for people with physical limitations who might otherwise avoid using a ladder to do everyday tasks such as light changing light bulbs. It is also strong enough and well made enough to stand up to heavy usage and will last for many years. Its high quality, simplicity of use and intelligent design make it the clear choice for our #1 Gold Pick winner. Little Giant Ladder systems does it again, coming in as our #2 Silver Pick second place winner as well, with the 13 foot Alta-One Model 13 Ladder. Made of the same lightweight, rust proof, aerospace-grade aluminum as the Flip-N-Lite stepladder, our second place winner is a highly versatile, multi-use ladder. It can be configured into a 90 degree ladder, an A frame ladder, an extension ladder and into 3 different scaffolding positions. It is made of the same dependable, highest quality standards as all of the Little Giant ladders are, with an emphasis on stability. The height of the frame is 13’, with the height from the bottom of the frame to the top rung being 11’. Its stabilizing legs that flare out from the base of the frame have a total width of 23.5”. Its height when collapsed it is 3’ 7” high and 1’ 11’’ at the base. It has a weight tolerance capacity of 250 lbs. per side. When in its A frame construction, the Alta-One’s tallest height is 5’ 4”. A lightweight for its size, it weights up to 10-15 pounds less than competition. Little surprise from a company as dependable as Little Giant, it comes with an unbeatable limited lifetime guarantee. This may be the last multi-purpose ladder you will ever need. The versatility, quality construction and stable design of the Alta-One will meet all your needs, indoor and out. Perfect for using on stairs, as a saw horse, or an extension ladder, you can even extend it out on either one side or one the other if you are working on uneven ground. This OSHA approved multi-ladder is so useful that it’s like having 5 ladders combined into one. It has an even weight distribution which makes it handy for carrying around, and if it’s kept well oiled, it can be safely stored out of doors. It comes with an instructional DVD that shows you how of use all of its configurations, so you’ll be sure to get the most out of it. Its flaring leg design helps you feel steady and secure when standing on it, so there’s no need to have someone steady it for you. It folds to so compact a sizes that even carrying it up and downstairs is easy. The Alta-One shrinks in size for small jobs and it expands to reach the roof of most one story buildings. Its versatility is amazing. A few things to think about before you buy it though. Although it is a lightweight for its class, it weighs more than the Flip-N-Go, and people with mobility or strength issues may have trouble with it. As with any ladder, you must exercise caution when using it. Fingers can get caught, feet can be hurt. Read the warning labels and follow the directions so you can operate it safely. Another consideration is that the rungs are narrow, so stiff soled shoes will work best when using it. While not as lightweight and convenient for everyday household tasks as the Flip-N-Light, the Alta-One is the best ladder for people who have a variety of small to medium sized jobs that they would otherwise need several ladders to accomplish. It is our proud #2 Silver Pick. 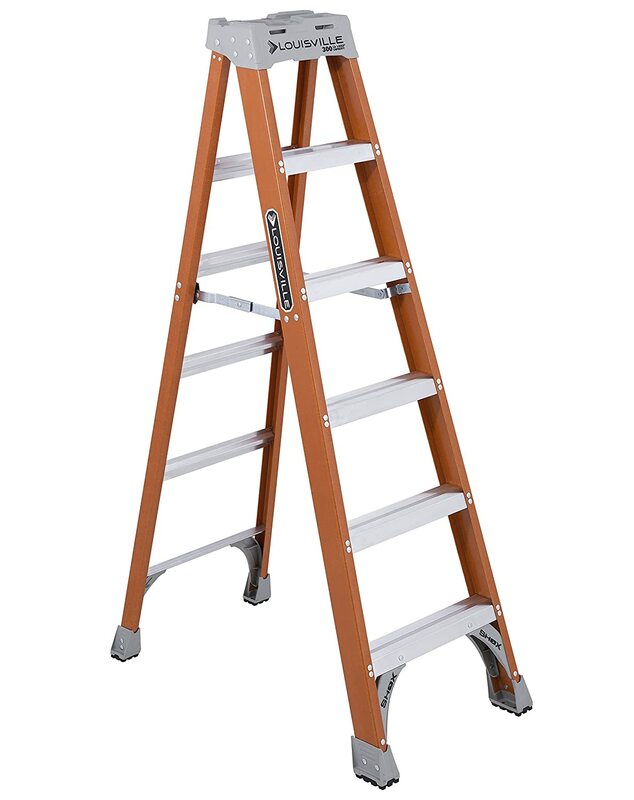 Our #3 Bronze Pick is the Louisville Ladder F31506 fiberglass ladder. It’s made of lightweight, non-conductive fiberglass with a polyester veil covering the full-channel rails. It weighs a light 17 lbs. total. It measures a full 6’ tall from the bottom of the feet to the top of the top step. It is 40” wide at the base and 22.6” wide across the top step. It is a hinged, folding ladder that has a narrow profile when collapsed. Every step on the Louisville F31506 is secured in place with 6 large head steel rivets for strength. The first of its five steps starts at 11” from the ground, the second step is 22’ high and so on to the top. The legs have heavy-duty support braces to give it even more additional strength to the base. The Louisville F31506 has a commercial 300 lb. weight capacity rating and is OSHA and ANSI approved. The top shelf on the ladder has molded-in slots and a magnet to help keep your tools from falling while you work. Each foot has a polymer anti-slip cap to help with balance and to protect wooden floors. The Louisville F31506 also comes with a 90 day warranty. The Louisville F31506 is an affordable alternative for people who like the safety of Little Giant ladders but want something more within their price range. The feet on the Louisville F31506 are larger than the feet that most ladders have and come with “Da Boot” anti-skid coverings that are both chemically and mechanically bonded to the legs for greater strength and stability. Perfect for small to medium jobs around the house and outdoors, the lightweight Louisville F31506 is easy to carry and maneuver, even when going up stairs. Its steps are deeply grooved to provide a good grip for your shoes when you stand on them. The spreader on the ladder holds the legs steady as you climb and helps to prevent ladder wobble. At the top of the ladder is the “Pro-Top”, a ladder cap molded into slots and trays to make working at the top of the ladder easier. It has a tray for hardware, a holder for a paint bucket, a holder for a screwdriver, drill slots, a 2X4/pipe holder and a magnetized tray. It’s a good ladder for weekend DIY’er as well as for professionals. Its non-conductive fiberglass and aluminum construction makes it ideal for electricians to use. It’s lightweight enough to be simple to move, yet heavy enough that you feel safe when you stand on it. It does have a few drawbacks though. Like with any ladder, you have to be careful when you set it up so you avoid getting your fingers caught. The hinge may be a little tight and may require a little oil to operate properly. It also lacks a tray, although you Louisville Ladder does sell them separately. While it is steadier than most big box store ladders, it is not as steady as the more expensive Little Giant ladders. Its fiberglass body has a plastic-like feel to it, so it may take some time to become accustomed to if you are used to the feel and weight of metal ladders. The Louisville F31506 is a solid third place Bronze Pick. It is stable, lightweight, easy to move and has a well-designed, well thought out ladder top for holding all your essential tools. Its non-conductive fiberglass body is perfect for electrical work. The Louisville F31506 is made to be safe and stable. 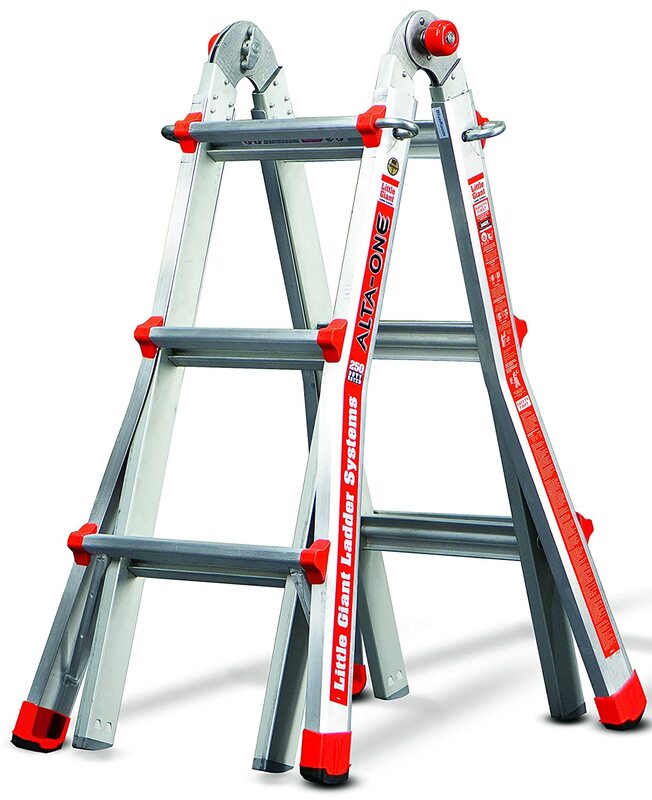 If you want a good quality ladder that doesn’t break the bank, then this is the one for you. Our pick for the best ‘Cheap” ladder is the Louisville AS2106. Made of aluminum, this light weight ladder has a weight capacity limit of 250 lbs. which covers the combined weight of the user and their tools. It stands at 74.4” tall, is 21” wide at the base when extended and is 6.8” wide at the top. The steps have a depth of 3” and are 12” apart from each other, with the top step being 5’ off of the ground. The ladder itself weighs 15.85 lbs. It comes with a fold down platform and a blue Louisville Ladder Pro-Top with slots and trays to hold your tools and equipment. The Louisville AS2106 has nonskid covers on its feet. It meets ANSI and OSHA standards for safety and comes with a limited warranty. The Louisville AS2106 is a standard ladder that does what a ladder is supposed to do. This light aluminum ladder is easy to carry and is perfect for everyday projects around the home such as changing light bulbs, smoke alarm batteries as well as light home decorating. Despite its height, it is light enough that a single person can carry it from job to job without a hassle. Although is it best used indoors, it can serve out of door as well if it is on a flat, steady surface. Its Pro-Top and its folding platform give you a helping hand by holding your equipment as you work. Its rubber feet on the end of the legs help to stop “ladder walk” as you stand on it to work and its hinged brace holds it open safely for you. It comes with a limited warranty too, so you can buy it with confidence. There are a few drawbacks though. It’s best used by people of light to medium weight, as its 250 lbs. load limit includes the user and their tools. It is a household chore ladder, so it is not suitable for heavy professional usage. But if you only need a ladder for honey-do types of chores, then this is the one for you. While it is nothing fancy, if you are looking for a ladder for standard usage, the Louisville AS2106 will fit your needs. 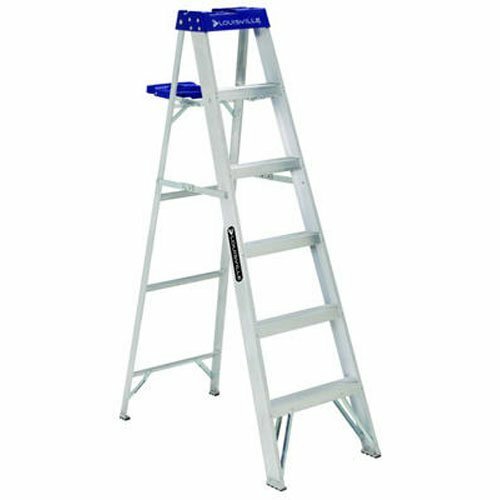 It is an affordable, everyday ladder that is safe, sturdy, light and easy to move. It solidly fills the slot for our best “Cheap” pick. Are you safe when you are up on the ladder? All of the ladders on our list were made with safety in mind. 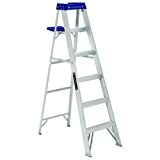 You want to look for a ladder with anti-skid feet to prevent the ladder from slipping or “walking” while you are on it. You also want to find a ladder that has support braces on the bottom or flared legs to increase its stability. This is of increasing importance the taller the ladder is. A hinge is another important safety feature for A-frame ladders to have, to brace the legs and provide greater strength at the upper end of the ladder. Be sure to buy a ladder that is up to holding the weight you put on it. Remember that the capacity load limit includes both you and any tools you might take up with you. Also, it’s important to remember never to stand on the top shelf of an A-frame ladder. No home improvement project is worth a trip to the emergency room over. Ideally you shouldn’t stand on the top rung of a 6’ or higher ladder either. A good rule of thumb is to stand no higher than the height at which the top shelf reaches your waist. Can you lift the ladder that you bought? Be realistic about how much weight you can lift and carry from your closet or garage to your work site and back. A ladder isn’t much good to you if you hurt your back lifting it. To find a ladder that is strong but still doesn’t weigh much, you should look for aluminum or fiberglass made ladders. They will have a lightweight frame that will still be strong enough to hold up to repeated uses. If you need a very large extending ladder, see if you can find one with wheels attached to the bottom of the legs. It is important to buy a ladder that is portable. This means getting one that is easy to store and transport from place to place. Measure the height of the place you plan to store your new ladder before you purchase it so you won’t have to return it as soon as you get it if it doesn’t fit. Also, if you plan to take it with you when you go out, make sure that its length not only fits in your vehicle but if you are planning to put it in the back seat, that it will fit through the door as well. A little forethought before you purchase your ladder can save you a lot of headaches later. A ladder is a purchase that is meant to last you for years. So even though you may be tempted to skimp out and buy the least expensive ladder that you can find, in the long run the cost of replacing it, not to mention the cost of the trips to the doctor from falling from a cheap ladder, will mean that you are losing money rather than saving it. Always buy the highest quality ladder you can afford to, and you will be glad you did for many years to come. A good ladder is a major purchase and investment for your home. Take the time to find the right model that fits your needs. Be sure you are getting one that is the right height for the jobs you need to have done, isn’t too heavy to be useful, is convenient for you to store and is the highest quality that you can afford to buy. A bad ladder will be nothing but a headache, but the right ladder will help you to make your house the home of your dreams for years to come.